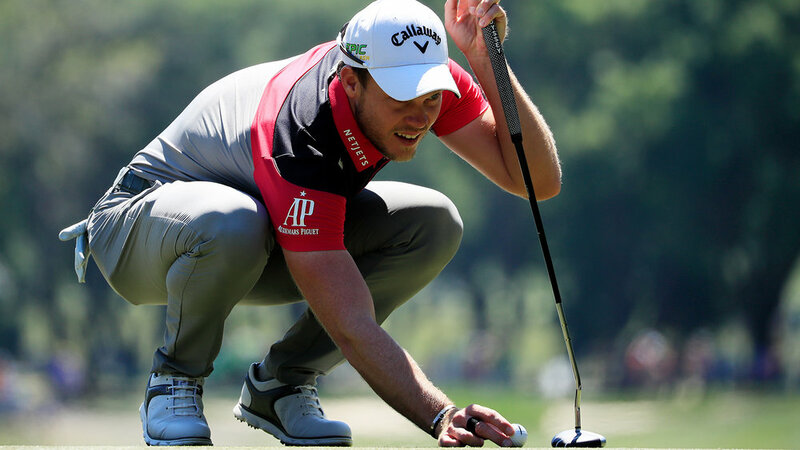 Once known as golf’s cheeky-chappy, Danny Willett’s wit has been pushed to the limit by the pain and frustration of trying to please sponsors, fans and himself. He admits that he should have been on cloud nine after winning a Green Jacket, but instead fell out of love with the game that had left him drugged up and unable to sleep. Something had to change; not only to save his career, but also safeguard his health, too. By the time he switched coaches and set about relearning the golf swing under the guidance of Justin Rose’s coach, Sean Foley, in August 2017, he had been reliant on painkillers for nearly five years. It took another six months to play four rounds without them, and even longer to see a turnaround in results. Before the Irish Open this year, the 31-year-old had slumped to 462nd in the world rankings and missed eight of his last 10 cuts on the European Tour. He can make light of his struggles now, having just ended the 2018 season with his first victory in 953 days, and chuckles when it’s put to him that the road to getting there has been anything but straightforward. “It’s certainly been eventful, that’s for sure,” he scoffs. With that remark, he orders an espresso – “I might need it,” he says – and starts to relay some of the darkest moments that left him fearing for his long-term future. Just how bad was your back injury? It got pretty bad. I was rolling out of bed, unable to properly stand up. It depended on how many balls we had hit. Travelling as well. That used to really kill me. Long-haul flights were disastrous. Even trying to sleep, I was better off trying to stand up but then you can’t recover doing that. Bending over to pick the kids up was hard work, and then playing golf was frustrating. Of course, you couldn’t tell because I was taking a couple of paras, a couple of Ibuprofen, a couple of Co-codamol to take the edge off things. You never know how painful it was because the tablets were helping to ease the pain. Were you still taking painkillers when you won the Masters? Yep! I was obviously playing very well at the time, and had the ball under control, but it was still a work in progress with the body. Every day, I was having to go through a pretty rigorous warm up. I would see the physio for half-an-hour to make sure everything was alright, then I’d do movement stuff on top of that, and then go to the range and hit balls. We were starting to warm up three hours before a tee time to get everything in place. After the round, we would have 45 minutes on a physio bench, trying to put the body back together again. It was a strange one because we were playing well. People were asking me to go play here, there and everywhere, but every week that I was playing it was taking more and more of a toll. Did you ever reach a stage where you felt depressed? On the golf course, yeah. I was in pain hitting shots and I wasn’t hitting good shots, either. The more poor moves I made, the more it hurt and the more it hurt, the worse the move got. It was a really bad spiral. When it’s your profession, it’s going to make you depressed and then you take it home with you. So, it got really foggy in my mind as to what I was trying to achieve. I felt like I was juggling so many things, trying to push myself to do well, when I may as well have taken six months off and let the body completely heel. I mean, I should have been on cloud nine at the end of 2016, loving everything, but I was in a lot of pain and struggling to cope. That’s why at the end of the season I had really burned myself out. Mentally, physically and emotionally. Golf wasn’t fun. Do you regret not taking the time off? I do regret it. But it’s a tricky one. The little man had just been born, and after Augusta I was going to take five weeks off anyway. That then became the most hectic five weeks ever. We had a two-week old baby at home, and paparazzi at the front door. It was a really hard time. Did you struggle to deal with the weight of expectation? You know what, if I had been playing well and had the body been good, I think I would have been fine. It was more the fact that I knew I was in a strange place. That was the worst thing. I love people to watch me flushing it on the range and holing putts. But for people to see me struggling and annoyed about how I was feeling, that was not a good thing. What did you change with Sean Foley to lessen the strain? The big change we’ve made is how the lower body works during the swing. Before, we never used to move the lower body at all which puts a lot of strain through the lower back when you’re swinging at high speeds. We’ve been trying to share the load throughout the body and gone a little old school in terms of how the lower half moves; getting that weight shifting properly and getting off that left heel. If you see pictures of Jack, Mr Player and Mr Watson, their legs move a hell of a lot in the golf swing. We’ve been trying to go towards that, which then eases the pressure through the spine and vertebrae. I used to make quite a compact, rigid golf move; whereas now it’s a bit wider on the way back and a bit wider on the way down. The extra width and extra turn now comes from the pelvis and lower body shifting across and then moving back up to the right heel in the backswing. Was that motion as difficult to put into practice as it sounds? When you’ve done something one way for five or six years, changing it up is always going to be really tough. The control aspect went out of the window. We were trying to make a big difference and that changed the ball flight visually and my numbers on TrackMan. That was very difficult to become accustomed to, especially when aiming on the golf course. How close are you to fully implementing what you set out to achieve? I don’t think you can ever put a timeline on it. In practice, I can make the move. So, me and Foles are now trying to get the mastery of the move, so I can stand on the first tee with the swing feeling natural. We’re not quite at that stage yet. I’m still trying to hold on and guide a few, and of course the annoying thing is that when you do that, you have a higher chance of hitting a bad shot. It’s a transition. We’ve gone from a move which feels as normal as it can, to a move which feels as alien as possible with the opposite ball flight. But does the body feel better? Much better. It’s now nice to wake up and within half-an-hour of doing some movement stuff, stretching and yoga, be ready to go to the range. Changing my swing has probably knocked off three hours of my day, in terms of warm ups and cool downs. I now wake up without being on any meds, which is a lot better for your stomach and health. And it just makes me happier. I can deal with playing badly at times and trying to do new things, but when your body is hurting and there’s nothing you can do, it’s incredibly frustrating. Even so, how difficult has it been working through a swing change and missing so many cuts at the start of the year? I kind of expected it. I was still in a bit of pain during the first half of the season. I flew out to Dubai early in 2018 to do a little bit with Foles. If I’m honest, I wasn’t ready to play the Desert Classic but I did it anyway because I know the guys very well. I wasn’t quite comfortable, and then I tried to play a little bit more, and still I knew I wasn’t ready. At the same time, you can’t keep hitting balls at home on the range. You’ve got to put yourself under the gun. Yeah, I missed eight of 10 cuts, but I was probably going to because of how things were. It’s more about getting back out here. I tore my shoulder in two places – one in my supraspinatus tendon and one in my labrum – in September last year, and had to take four months off. At the beginning of this season, I almost wrote off this year (‘18) in its entirety. So, had someone told Foles and I in February that we’d make Dubai at the end of the year, we probably would have taken that. For me, it’s been a nice little achievement to plough on through, and really grind this season out and make it work. Productive would probably be a good word. We pulled out of a few events early on, but a big turning point was Malaysia. That was the first tournament that I had not used painkillers for over five years. Since then, the golf’s not been fantastic but every week the body has been getting better gradually, and I’ve been able to train a bit harder. I’m now in a lot better shape, and that’s always a pretty good place to be in. Things are coming together nicely, and in terms of how the body moves and the swing feels, it’s been very successful from where we started at. Looking ahead to 2019, what’s your motivation behind rejoining the PGA Tour? I think it’s a place you need to go to see how good you are and test yourself. They’ve got a lot of the best players playing week in, week out, and I think the strength in depth is exceptional in America now. I’ve still got three years of exemption left and had I got to that last year and gone, ‘I really like it here,’ I would have regretted it. So, why not do it sooner rather than later? The kids are still young enough, we’re not committed to any schools and we’re at a nice time in our lives where we can test it and see if we like it. There’s pros and cons across the board but it’s one of those things which I felt I had to do. After almost disappearing off the radar since the Ryder Cup in Hazeltine, have you got a point to prove in America? Not really. I mean, I would have loved to have cracked on as soon as I won at Augusta and played a lot more in America. But the body wouldn’t allow it and we had a young child. The timing didn’t quite suit, plus it was more the fact that I wasn’t physically in a place to do it. But we’ve now got a place out in Orlando. We’ve joined Isleworth which is a beautiful place to practise. It will be interesting to see how it goes, but it’s an exciting time. Where does your victory in Dubai rank among your other tour titles? Winning’s a rarity on Tour, really. I’m pleased to have won the tournaments that I’ve won over the last few years. I’ve won some pretty big ones, and obviously Augusta is always going to be special. But this, coming back after everything that’s happened, is going to go down in the history books for myself as one of the most pleasing. When will we see you in the UK? I haven’t got a clue how everything fits in with family life and travel wise. With the FedEx Cup finishing really early, it helps us Europeans because after that, there’s still a lot of events on the European Tour. I think the two tours have come together to try and make sure the European Tour has the best fields for their biggest events. The BMW PGA Championship is one that has changed position in the calendar, but it works well and I don’t think we would ever miss Wentworth anyway. It’s one of those tournaments you would really love to win as a Brit. What about the British Masters? Will we see you at Hillside and would you be keen to host it in the future? We actually spoke to the Tour about hosting it, but I think they forgot! May is a very busy time in America and because they’ve messed around with the dates, it might be a tricky one to fit in. After watching the emergence of Tommy Fleetwood and Matt Wallace, do you feel like the forgotten man of English golf? It does seem a long time ago since we won the Masters. A lot of the young English lads have played really well, and bumped past me in the rankings. But Augusta is something that no one can ever take away from me. And until those guys go and win Majors, I guess we’ve still got one up on them. If your career ended now, would you feel fulfilled? There’s still a few goals I’d like to tick off. I’d like to compete more in Majors and the Race to Dubai, and give it a go for the FedEx Cup. I’ve finished second in the Order of the Merit twice, got my Major and won several times. If my career ended now, you would look at it, see me sitting inside the top 30 on the all-time money list at the age of 31, and think, you’ve done alright. Well done. But we want to push and if the body is in the shape I think it’s in, then hopefully we can make some good strides.